2. Do I have the right mix of investments? 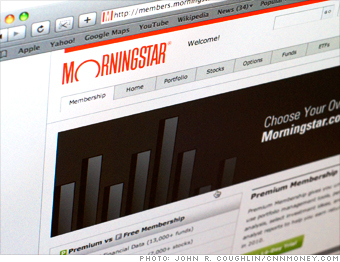 The first, critical step is to be sure you have a complete picture of what you really own, and Morningstar's Instant X-Ray is the best tool we've ever found for that. Just type in the investments you hold, and you'll see how much of your total portfolio is in stocks, bonds, and cash, as well as how much you hold in each sector, world region, and stock category, such as large growth or small value. You may be surprised at what you see. You are likely to have a lot more of your portfolio in equities than you did a year ago, when stock values were way down. Or the mutual funds you own may have changed their tactics. "You might want to have just 20% in cash, but there are managers who might go 50% into cash," says Maryland financial planner J. Patrick Collins Jr.
Coolest feature: You'll also see the total fund fees you're paying and whether that's relatively cheap or expensive. Try this too: To estimate your ideal percentage in stocks, a simple guide is to subtract your age from 110. For a more refined view, take a risk-tolerance test from FinaMetrica, which through April is offering Money readers a free report at Riskprofiling.com/money. NEXT: 3. Is my portfolio too risky?